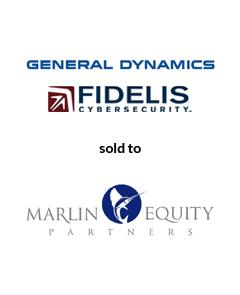 General Dynamics has sold Fidelis Cybersecurity Solutions, Inc., a leading provider of Advanced Threat Defense solutions, to Marlin Equity Partners, LLC, a global investment firm with over $3 billion of capital under management. After successfully advising Fidelis on its sale to General Dynamics in 2012, AGC was retained by General Dynamics to advise on its divestiture of Fidelis. The transaction closed on May 4, 2015. With a team led by Maria Lewis Kussmaul, AGC Partners acted as a financial advisor to General Dynamics.